Salwa Atwan BDS., DDS., MS.
Dr. Atwan graduated from the University Of Detroit Mercy School Of Dentistry with a DDS degree. She received a MS degree and a Certificate in Pediatric Dentistry from the University of Nebraska Medical Center-Omaha, as well as a Certificate of Dentistry for the Disabled from the University Of Washington Seattle School Of Dentistry. Dr. Atwan is currently an associate professor and a chair of the Department of Pediatric Dentistry at the University Of Detroit Mercy School Of Dentistry. She achieved Diplomate status of the American board of Pediatric dentistry and she is a member of numerous international, national and local organizations, including the American Academy of Pediatric dentistry, American Dental Association , College of Diplomate of the American Board of Pediatric Dentistry, American Dental Education Association, Michigan Dental Association and the Michigan academy of Pediatric Dentistry. 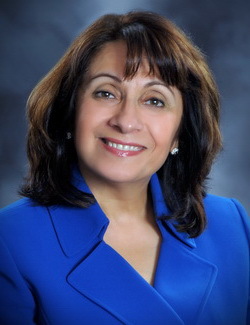 Dr. Atwan, her husband and three children have lived in Michigan since 1989. Paulette is our wonderful assistant Paulette. She is responsible for assisting Dr. Atwan in all your child's needs including taking x-rays, administering fluoride, sterilization, and assisting during procedures performed on your little one. She has 2 children of her own. She is exceptional with children and if your child has any fears, she'll help them through all procedures with a kind hand and big heart.